During Math Writing, students express and articulate their thinking and understanding of a math problem or math concept using pictures, numbers, charts, graphs, and words. These prerequisite lessons set the stage for productive and engaged rounds of Math Writing, which is one of three authentic math activities that help students achieve their math goals. Select a topic below to browse supportive resources. Use assessments, curriculum, and resources to provide “just-right” problems for students and teach them how to get started. Once foundation lessons have been learned, a joyful and successful launch can commence. During Math Writing, students express and articulate their thinking and understanding by working on a math problem or math concept using pictures, numbers, and words, and occasionally by creating problems of their own. Through this systematic, explicit teaching, all students develop independence and build stamina for this valuable activity that fosters independent learning and success. 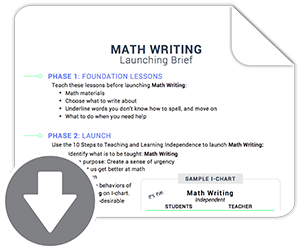 This one-page guide will help you remember what foundation lessons to teach before launching Math Writing and what essential behaviors need to be placed on the I-chart.